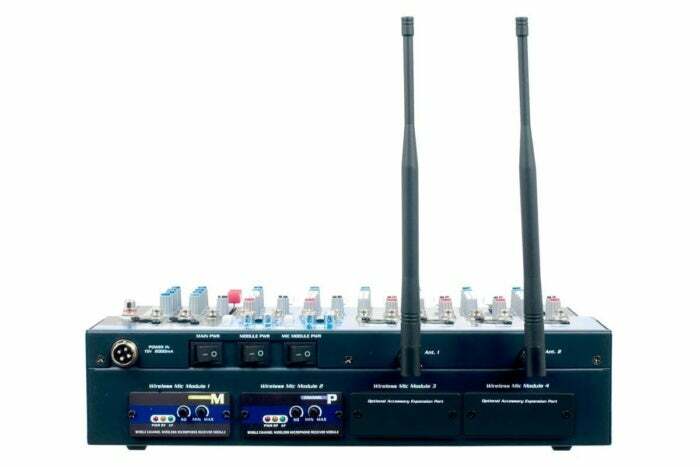 An all-in-one, easy-to-use eight-channel live sound and karaoke mixer combined with two UHF wireless mics and an SD audio recorder. As Apple proved by removing the headphone jack from the iPhone 7, we live in an increasingly wireless world. While that decision remains controversial, few would argue the stage is a place where wires are definitely unwelcome—but wireless microphones have traditionally been out of reach for impoverished vocalists. At roughly 14 x 10 x 3 inches, the mixer is small enough to be almost portable, but weighs a hair over 9 pounds. The all-metal casing is solid with a rugged, utilitarian look that won’t win any design awards, but is made to withstand day-to-day abuse while moving between practice rooms or gigs. What sets the WirelessMix-2 apart from other mixers are a pair of receiver modules preinstalled on the back. Attach the included antenna, stick a couple AA batteries in each of the included UHF wireless mics, power on, and start singing. There’s no complicated pairing or other setup, since the mics are preconfigured to the proper channels. Getting started with the WirelessMix-2 is a snap, thanks to the preinstalled wireless receivers already tuned to the frequency of the included mics. Better yet, there’s space for two additional plug-and-play modules for a total of four wireless mics. 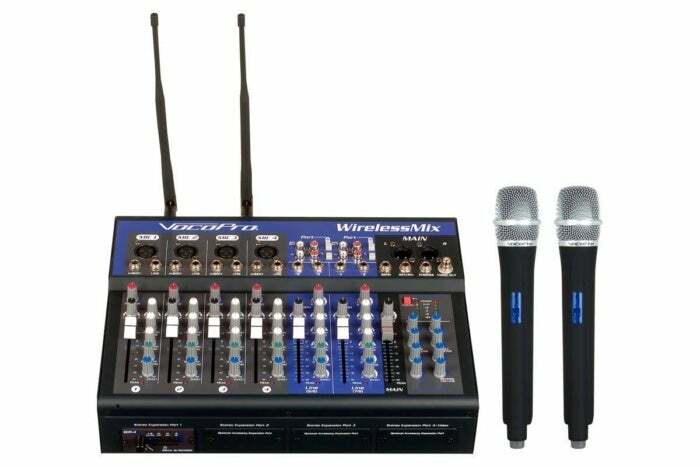 (VocoPro also offers the four-mic WirelessMix-Ultra for $1,199 MSRP.) The mics themselves are made from sturdy plastic; I wouldn’t recommend throwing them around the stage, but otherwise they’re well-constructed and fit nicely in the hand. Wire-free performances aren’t the only thing in VocoPro WirelessMix-2’s bag of tricks. There are also four stereo expansion ports along the front of the mixer, one already occupied by an SDR-4 digital recorder/player. Stick an SD card up to 32GB into the slot, press the tiny Record button, and the module begins recording stereo MP3 files (16-bit, 44.1 kHz sample rate and 128 Kbps bitrate only) of whatever’s coming out of the mixer. There’s even a volume knob and LED meter for controlling the record level, as well as record, play, and power indicators. Last but not least, WirelessMix-2 includes on-board DSP effects for the mic inputs, which can be used to add real-time echo, repeat, delay, reverb, and hiss. Channels five through eight feature a vocal cancellation feature intended to strip a singer’s voice out existing stereo mixes and make it karaoke-friendly, but this didn’t do much for the songs I tried (aside from flatten the mix to mono). It’s important to note WirelessMix-2 is intended for live sound. I don’t recommend this for studio work, because the unit introduces a fair bit of ambient noise to the mix. The wireless mics aren’t to blame; I removed all three expansion modules, and the noise was still audible in a quiet room. It’s less of an issue on stage or in noisier environments, however. It’s easy to record practice sessions with the band, thanks to the built-in SD recorder located on the front of the WirelessMix-2. VocoPro WirelessMix-2 is an affordable, full-featured solution for vocalists looking to go wireless, but lacks the fidelity of more demanding studio work.